We have a nice selection of excellent books! Adriana Hofstetter is back and still marching to the beat of her own sixteen-year-old band. When Hollywood High School begins production on their school musical, Adriana is there doing a story for the school paper. But when Bethany Miller, a student and cast member who has an unhealthy addiction to Instagram, doesn’t come home from school and remains missing, Adriana goes on the hunt to fi nd out what happened. Talking to irritating students, baffl ed teachers, and doubting detectives, Adriana is having no luck piecing anything together. With each passing day looking worse for Bethany Miller, Adriana must use all her wiles in trying to solve what happened. And then she receives a note, a one-word note: Stop. And then another threatening note is left on her apartment door. Can Adriana fi nd the culprit before the culprit comes after her? Of course, best friend Billy Feldman is there to lend his support while playing one of the leads in the show, mother Margaret is there to keep her eye on Adriana while listening to her loud, classic rock-and-roll, and Detectives Ramirez and Coyne are there to listen to and question what Adriana discovers. 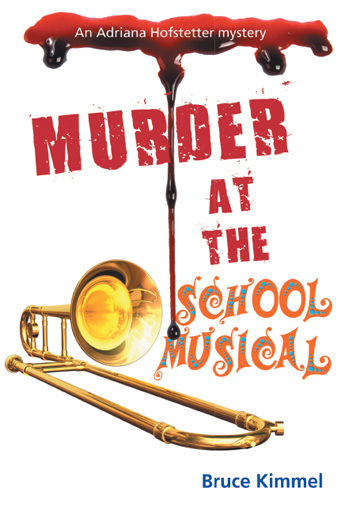 With colorful depictions of Hollywood, Adriana’s trademark sense of humor, and a crime to be solved, Murder at the School Musical is funny, suspenseful, and a cautionary tale of addiction to social media. Bruce Kimmel is the author of twelve previous books, all of them published by Author House—he is, in fact, Author House’s most-published author. He has a successful record label called Kritzerland, and has worked either as an actor, writer, director, or record producer for over forty-three years. He also has the longest-running “daily blog” in the history of the Internet, having never missed a day since November 9, 2001. He lives in Studio City, California. “‘I’m not part of this generation!’ huffs Adriana Hofstetter, defiantly declaring her independence from her fellow students at Hollywood High, as well as stating the obvious. For Adriana is the squarest peg never to fit in a round hole... not that she’d want to be pigeonholed by the usual teenage obsessions. Even she calls herself a freak. Her fashion sense has gone the way of the Dodo bird. She’s “new” technology-challenged. And she’s utterly confounded by social networking (understandable when your only friends are the musical-mad gay Billy and an octogenarian ex-film producer who rattles off more one-liners than Henny Youngman).